Stereocards were the sensation of Victorian times just as television was in the twentieth century. The fascination created by a simple card with two views side by side was immense and the craze lasted well into the new century. In many ways I think they are the purest form of 3D imaging and it can be argued that modern VR technology is directly descended from them. 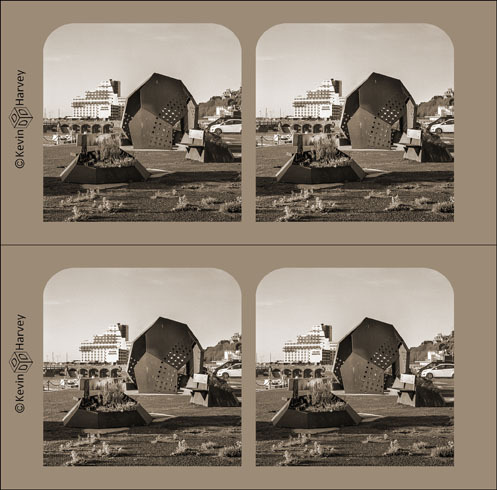 As a tribute to the pioneers of stereophotography I greatly enjoy producing my own stereocards in a retro style complete with a sepia tone. To make the experience more realistic I have often used film cameras to create them alongside my modern digital cameras. This gallery contains examples from both capture technologies.